Most avid attendees of conventions love to collect the badges, passes/tickets, or pins they acquire while attending cons. Unfortunately, most people end up hiding them in a shoe box under the bed, or collecting a mess of lanyards on a single doorknob. Today I have a number of ideas to share with you guys on how to display those old badges. Time to add some decoration to your house, show them off with pride, and be reminded of all the wonderful memories they represent….it doesn’t matter if your passes are paper tickets in plastic sleeves, hard plastic id cards with clips, or even pin-back buttons; I’ve got solutions for all of these. There are a number of ways you can use frames to display your convention badges, tickets, patches, art & pins. If all the items you’d like to display are flat, a conventional frame is a great option. If you want to frame 3D objects or a mixture of items, like badges & pins, then shadow boxes are the perfect way to go. You can even include additional photos, or items purchased from the Artist’s Alley in your shadowbox. Another fun idea is to add strings of wire or a mesh chicken wire to a frame, then clip all your badges on.Feel free to play with your layouts when creating your framed designs. You can make a collage of items, you can opt for neat rows & columns, or you can arrange the items into an overall shape for added fun. Speaking of shadowboxes, why not display your pins, patches, artwork & badges in a shadowbox coffee table? These types of tables come in many varieties, from a large-open space, to many smaller compartments. You can easily throw in other fun mementos & fandom collectibles for display too. Alternatively, having a plexi-glass topped coffee table mimics the framed wall display and it makes swapping items out easy. Badges of all types can easily be pinned to a cork board. You can even hang your pins & patches on the cork board too. What’s great about this setup is the easy access you’ll have; great for rearranging whenever you feel the need or rotating the collection if it’s large enough. Maybe the con badges you have include a lot of plastic holder sleeves. Create a booklet of them by binding them with a keyring or piece of ribbon. Then display your badge book on your nightstand or coffee table. Perhaps you want a way to collect and organize your badges without displaying them. If that’s the case, and you have a lot of plastic id badges, then the storage brief case may be the best option for you. This case safely keeps and organizes your badges and easily stows away. Purchase any sort of post shelf, closet hanger with hooks, or any other type of multi-hook hanger to display your badges on lanyards. You can easily pin your buttons to the lanyards as well. If you want, you could hang ribbon from the hooks and just attach your pins or patches instead. Another great idea for holding & displaying your badges in plastic sleeves is to remove the shade from an old lamp, then hang your badges (using paperclips) from the shade’s remaining wire rims. Sticking with the theme of lamps, lampshades are also the perfect spot to display all your pins from a convention. To make your pinback buttons pop, opt for a shade that has a more neutral color palette & pattern. Feeling extra creative or want a way to keep all your badges nice, without actively showcasing them all around your place? Scrapbooking is the perfect solution! Add your pins to a piece of elastic to create a bracelet out of them. Make a couple different ones or switch the pins out as you fancy. If you don’t mind gluing your pins, you could glue them into empty bezel trays and create a chain bracelet too. 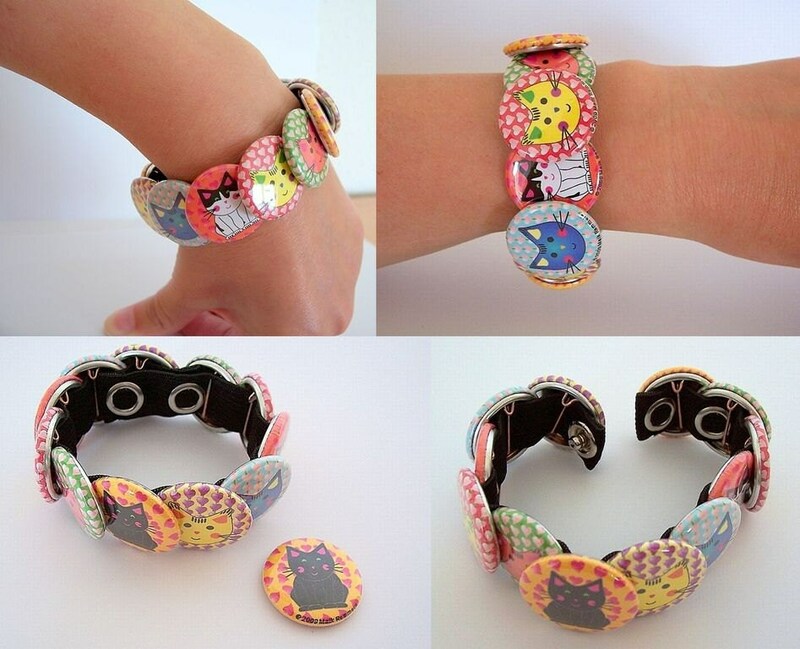 If you don’t mind sewing your patches, you could easily use them to create a bracelet too. Turn your pins into earrings or necklace pendants. Make a resin top coffee table with your pins or con badges. Turn your pins or plastic badges into fridge magnets.If you have a collection of shirts from conventions you can easily turn them into a t-shirt quilt. Hopefully this post has inspired you to pull out that shoebox of badges and start showing them off around your house or room. If you do, please share a photo of your new display with me on Facebook or Twitter. I’d love to see your collection! What do you do with con badges? Do you have additional ideas? Share them in the comments below. Which one of your badges or pins is your favorite -does it relate to your favorite con memories, or do you just like the look of the badge? This is really awesome! I sell buttons so I’m so saving this post to show people in the future! Woot! Glad to help a fellow geek out. Do you sell your buttons online too? Great ideas! I have mine hanging off my wall calendar but they always fall down. Thanks Danielle! Funny you mention a calendar…I was trying to come up with an easy way to turn the badges into a calendar. It’s possible but it would take some crafting. Some great ideas! I have loads of theatre tickets I need to frame they have so many good memories! Fabulous post. I love the corkboard idea! I’m going to wait until I have more con badges to do something like this! Love the idea of using buttons to make a framed shape like that! I am definitely doing that with mine! So glad I could inspire you Kay. Would love to see the finished product! Oh bummer…I’m a slight bit of hoarder because A) I’m sentimental B) Afraid of wanting/needing something again down the road and no longer having it. Haha. It’s a blessing and a curse. That’s a great idea you have though! Oh my gosh those are all really fun ideas of comic con badges and stuff I would never think of. Honestly mine either end up in the trash or lost somewhere in my house. I bet your hair bows are super cute. What a fun way to wear the buttons! These are fabulous tips! I love the key ring as I attend DragonCon and our badges usually have a ribbon of 3 stuck to them. Our lanyards we have on the Command books that have long shinny hooks to them, and they adorn our the sides to tall bookshelves. The lanyards also hold buttons, but I like the nondescript lampshade idea. Thanks!